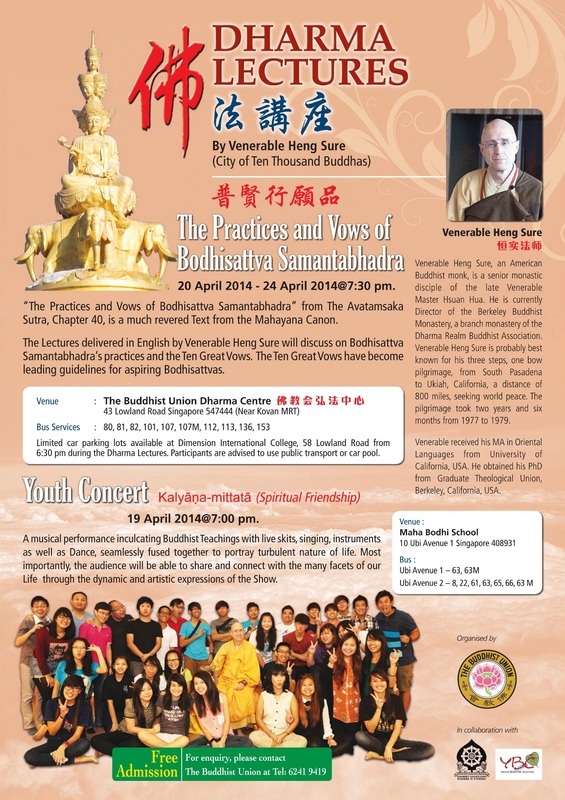 The Singapore Buddhist Union organised a 5-day dharma lecture on the Practices and Vows of Bodhisattva Samantabhadra of the Avatamsaka Sutra from 20 April 2014-24 April 2014. This was Rev Heng Sure fifth Dharma lecture at the Buddhist Union. Samantabhadra Bodhisattva, also known as the Universally Worthy Bodhisattva. Samantabhadra Bodhisattva usually reposes with dignity on a six-tusked white elephant. Samantabhadra is a great Bodhisattva of the Tenth Stage, with the particular quality representing cultivation and practice. Like Manjusri Bodhisattva, Samantabhadra is also assigned his universe in the east. In China, people worship Samantabhadra as the object of pilgrimage in Emei Shan (Mountain), which is regarded as his dwelling place. The first of the Ten Great Kings of Vows is "To respect all Buddhas." (禮敬諸佛)Ordinary people would say: "Buddha images are made of wood or clay; what use is it to bow to them?" When we bow to the Buddhas, what counts is the mind of respect. Regardless whether the images are made of wood, clay, or any other kind of material, we should bow with a respectful mind. We are not only bowing to one Buddha, we are bowing to all Buddhas of the ten directions and three periods of time. It can also be said that we are respectfully bowing to limitless Buddhas of the ten directions and three period of times throughout the Dharma Realm and empty space. The second vow is "To make praises to the Tathagatas. "(稱讚如來) After we respectfully bow to the Buddhas, we shall make praises to the Tathagatas. What do we praise the Tathagatas for? Is it because the Buddhas like to be praised? That is not the case. The merit and virtue derived from praising Buddhas is boundless. It is to enhance our own Dharma body and wisdom life, and to increase our own wisdom, that we make praises to Buddhas. On the part of the Buddha, he remains a Buddha whether we praise him or not. He does not need that. However, on the part of us ordinary people, we should make praises to the Tathagatas. "Tathagata" [Thus Come One] is one of the ten titles of the Buddha. Then, is it enough to make praises to the Buddhas? No, that is still not enough. The third vow is "To practice profoundly the giving of offerings." (廣修供養)Profound does not refer to small offerings. It means that one must bring forth a great Bodhi mind to make offerings to the boundless, eternally abiding Triple Jewel of the Buddhas, the Dharma, and the Sangha of the ten directions and three periods of time throughout the Dharma Realm and empty space. The fourth vow is "To repent and reform all karmic hindrance. "(懺悔業障) When we make offerings, we should repent of our karmic obstacles in front of the Buddha. Why should we make offerings? It is because we feel that our merit and virtue are not sufficient and that our karmic obstacles are heavy. Therefore, we should repent of our karmic hindrance in front of the Buddha after we make offerings. we will know that karmic obstacles are originally empty. we still must repay all the debts created in the past. If we could truly understand, then we will know that karmic obstacles are originally empty. If you truly understand, if you are truly enlightened, then you will know that karmic obstacles are basically empty. However, before we come to that understanding, we still must repay all the debts created in the past. Before we come to understand what it is all about, we still have to repay all the debts. Universal Worthy Bodhisattva contemplates the real mark of all dharmas. What is meant by the real mark? The real mark means that which has no mark. Though it is without a mark, there is nothing which is not marked by it. Thus, the real mark means, "It is without a mark, but nothing is not marked by it." Since the essence of the real mark is wonderful existence, it is also true emptiness. Only true emptiness can give rise to wonderful existence; and only wonderful existence can contain true emptiness. True emptiness is not empty; thus it is wonderful existence; wonderful existence is not existence, thus it is called true emptiness. Both the existence that is transformed from emptiness and the emptiness that is transformed from existence are the wonderful existence transformed from true emptiness. The wonderful existence returns to true emptiness. This is called "The real mark is without a mark. However, nothing is not marked by it." This Bodhisattva cultivates this Dharma-door of repentance. To repent of karmic hindrance means to repent of all offense karma. To repent of all offense karma is called repenting and reforming all karmic hindrance. The fifth vow is "To rejoice and follow in merit and virtue." (隨喜功德)To follow with joy means to draw near whomever does beneficial things. We should follow joyfully to praise people who do any kind of merit and virtue. It is to follow with joy if we praise others for their meritorious conduct. It is also to follow with joy if we actually do it ourselves. To rejoice and follow is to do our share to the best of our ability. The sixth is "To request that the Dharma Wheel be turned. "(請轉法輪) We request the Buddhas, all the great Bodhisattvas, and all the worthy sages of the Sangha to turn the Dharma Wheel. What does it mean to turn the Dharma Wheel? It means to teach and transform living beings. By giving lectures on the Sutras and speaking the Dharma, one is turning the Dharma Wheel; by printing Sutras and establishing Way-places, one is also turning the Dharma Wheel. If you build a foundation for anything related to Buddhism, then you are turning the Dharma Wheel. When we cultivate, that is also turning the Dharma Wheel. Therefore, the meaning of turning the Dharma Wheel is very broad. The seventh vow is "To request that the Buddhas remain in the world." (請佛住世)The Bodhisattva's seventh vow is to request that the Buddhas stay in the world and not enter Nirvana. The eighth vow is "To always follow the Buddha's teaching." (常隨佛學)In his eighth vow, Universal Worthy Bodhisattva wants to follow the Buddhas at all times to learn the Buddhadharma. The ninth vow is "To constantly accord with all living beings. "(恆順眾生) To accord with all living beings means not to go against their wishes. Well, does it mean to try to get living beings to like us? No. That's not it. It does not mean to be like living beings, nor does it mean to be influenced by them. To accord with living beings means to accord with living beings' natural dispositions while causing them to reform and change from evil to wholesome, and to return from confusion to enlightenment. It does not mean to flow along with them in the current of birth and death.